GREETINGS FROM PLANET NINE « THE BRYCE IS RIGHT! 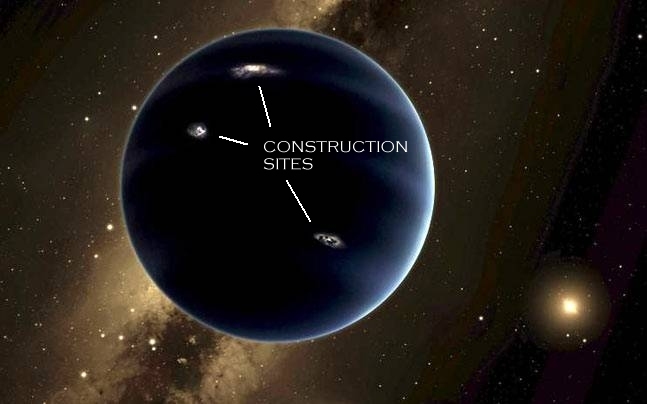 Last month, scientists at the California Institute of Technology claim to have discovered a new planet, temporarily named, “Planet Nine.” This was welcome news since Pluto was downgraded to “dwarf planet” status. Planet Nine is said to be 10 times bigger than Earth, and as the farthest planet in our solar system, it takes approximately 20,000 years to complete one orbit. In truth, the planet was discovered eight years ago but has been kept secret by developers who are turning it into a luxurious retreat where Hollywood celebrities will be moving following the election of Donald Trump as President in 2016. Insiders claim the new planet will be dubbed “Hollyworld.” and celebrities have already mapped out spacious estates. One developer was quoted as saying the smallest property will make the Ponderosa seem puny. In addition to homes, a massive media infrastructure is planned so entertainers can continue their work there and is said to include studios for motion pictures, television, radio, music, etc. Although travel to and from the new planet would normally take years using conventional spacecraft, technicians have finally unlocked the secrets of beaming technology as introduced by Gene Roddenberry, the creator of “Star Trek.” This reduces the amount of travel from years to minutes. * A massive government infrastructure will control everything. You will not be able to do anything without a permit. As such, it will be the largest employer on the planet, followed by 7-11 clerks. Nonetheless, Civil Servants will run the world. * There will be no taxes; everyone will be required to turn their assets over to the state for safekeeping and financing the world. This means there will be no theft or burglary, but little in terms of employment as everyone will be classified as wards of the state. * Energy will be furnished exclusively by solar wind farms. Without petroleum, there will be no pipelines or carbon emissions other than the hot air from the inhabitants. Interestingly, there is a genuine concern for the polar caps melting, even though the planet is the farthest from the sun. * Guns are not permitted, which explains why there will be a major drug culture on the planet. Meth labs will operate 24/7. * A complete program of socialized medicine will be available to inhabitants. Everyone will be entitled to free health care, generously paid for by the celebrities. Hospital doctors and nurses will work for the government. * Illegal immigration will be permitted and will be allowed to vote in elections, as well as those deceased and buried on the planet. It is expected, immigrants will come from Jupiter, Saturn, Uranus, and Mexico, of course. It is expected California Governor Jerry “Moonbeam” Brown will be named the planet’s first “Chief,” a title selected in honor of Native Americans and the Washington NFL franchise. No word yet as to who will fill the seats for the Secretaries of Karma, Inner Consciousness, and Meditation. In related news, Donald Trump announced a new magnetic beam that is reported to be so strong, it can release a planet from the solar system thereby allowing it to float out into space. Americans eagerly await the first demonstration so that Earth may return to normal. NEXT UP: ACQUISITIONS: A BAD SIGN? – Another indicator of the fragile state of our economy. LAST TIME: NOBODY THINKS BIG ANYMORE – particularly in the systems world.